Plaster surfaces are a bit rough on their surfaces because of their porous nature and this makes them susceptible to various stains. The plaster surface of the pool is expected to degrade with time because of occasional acid wash. This acid wash is meant to take away a thin surface of the plaster so as to expose the unstained plaster below. Vinyl pools are made of a slick surface that makes them resistant to staining. There are, however, elements that can cause staining on the vinyl pools such as organics, minerals, and metals. These elements tend to deposit and even stain vinyl liners. Once vinyl pool surfaces age, they lose their resistance to chemical degradation and UV rays; this makes the pool surface more likely to fade and stain. Hairpins or nails that fall into the pool can lead to rust staining. Iron is also carried inside the pool once old pipes are used to add water in the pool leading to rusting. If you see a rust spot reappearing on your plaster pool, it can signify that a rebar wire is near the surface. To avoid treating the same stains repeatedly, you must pinpoint the cause of rusting. In this method, you will require a sock and sodium bisulfate (dry acid). You need to pour a cup of sodium bisulfate in the sock, tie a knot on the sock to contain the acid. You should position the sock over the stain using the pool pole. The acid is going to eat away the stain in a few minutes depending on the age of the stain; it can take 5-15 minutes. During and after this procedure, brushing the stain with a stiff brush can be of significant help. It is crucial to check the sock frequently so as to strike a balance between the stain and the area surrounding it. This method is perfect for removing stains in your pool. Jandy master is a tool that siphons liquid acid from a bottle to the pool surface. Using this tool, you can easily do underwater acid washing in small areas of your pool. To avoid reverse staining, you need to actively and slowly move the tool in circular motions around the rust stain. Rust stains can easily be removed by rubbing vitamin C tablet over the surface. Another way you can use Vitamin C to remove the stains is by putting 20-30 Vitamin C tablets in a ziplock bag and then hammer them to powder form. You need to sprinkle the powder over the stain and brush vigorously. For this method, you need a 2 inch PVC pipe and Acid. You need to put one end of the pipe over the stain and the other end above water; you now need to pour the acid in the pipe. You need to hold the pipe over the stain for 30 seconds, and then move it in a circular motion around the stain to increase the diameter covered by the acid. 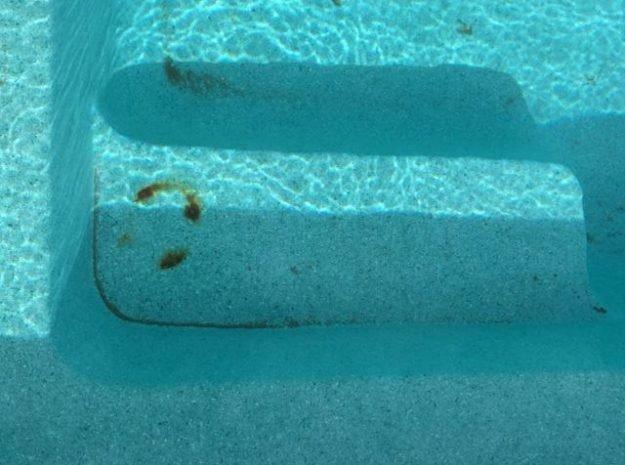 Do you have a reoccurring rust stain on your plaster pool? This is probably caused by a rebar tie wire or the rebar itself. To solve this, cut through the rebar, and then chisel deep below the rebar. You now need to coat the rebar with a rubber sealant, let it dry and fill the hole with hydraulic cement. When the cement is dry, you have to top the hole with plaster and refill your pool. Removing pool rust stains is simple when you know the techniques that you need to use. Follow the techniques outlined in this post and you will have a stain-free pool in no time.